Summary : Finally, we exclusively release this series in DVD source quality and very good English Subtitle. Adapted from an Japanese manga of the same title, Devil Beside You combines efforts of the most famous TV series producer Angie Chai (who once created the miracle of Meteor Garden) and rising young idols such as Mike Ha, Rainie Yang, Kingone Wang, and Cai Pei Lin! The romance comedy was extremely popular when it was broadcast in Taiwan! Mike Ha and Rainie Yang play a couple who often quarrel with each other. Mike is a boy who doesn't know how to express his love for his girlfriend, a lively girl played by the hot singer Rainie Yang. 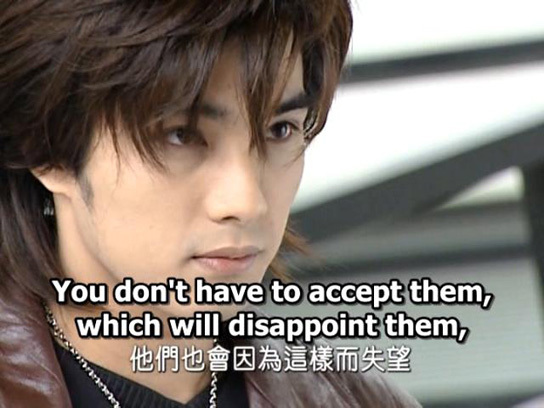 Apart from the idols' handsome faces, their dramatic acting is also what appeals to the Taiwanese audience, making Devil Beside You the best-loved Taiwanese romantic TV series in 2005! "This drama is so good! I have seen this drama with english subtitle...and let me tell you...this drama is damn good! This is even better than Meteor Garden and Mars! This drama contains hotter guys! This drama is a must watch!!!." "This is the best Taiwan drama I have watched through 2005. For those who hasn't watched, this is highly recommended. The story is good and actually better the comic and Rainie and Mike made the perfect couple out of this series. Very sweet and cute all the time." "this drama has good chemistry on the main cause Ranine Yang and Mike He. They look like a couple in this drama. I will only explain the begining and the end. you have to watch the drama to see for yourselve. This drama started out as a devil (played by Mike He) who fell in love with a sweet girl (played by rainie). First they were teasing each other. At the end of the drama, they becomes lovers. Overall, it is a good drama and you should definately see it." "DBY is a must see drama if you like to laugh, but yet also very sweet with all the romantic scene and every handclaps. It does has some seriousness once in a while but especially in this sery, it doesn't drag on. All the actors and actresses in this movie are hot and good-looking, and their acting is beyond great....I got to see it to know what I mean. I will recommend this to everyone I know."